Last week I hinted about a salad recipe that I wanted to share with you and today I'm following through. This salad has become one of my favorites recently because it is filled with all of the fresh flavors of summer: crisp greens, sweet peaches, fresh onions and herbs, and nutty sunflower seeds. Topped with some shredded chicken breast and creamy goat cheese and topped with a simple vinaigrette, it's exactly the kind of lunch I want to eat-- so satisfying and filling that I recently enjoyed it for 4 lunches in a row. Excuse the photography, please. This was an actual lunch at my desk, in my Tupperware, under the fluorescent light. So, give this delicious summer salad a try. It makes a great lunch, but served with a little crusty bread on the side it would be an excellent easy no-cooking-needed dinner on a hot summer night. 1/2 cup cooked chicken breast *Try this recipe for slow cooker shredded chicken -- it's super versatile and amazing! 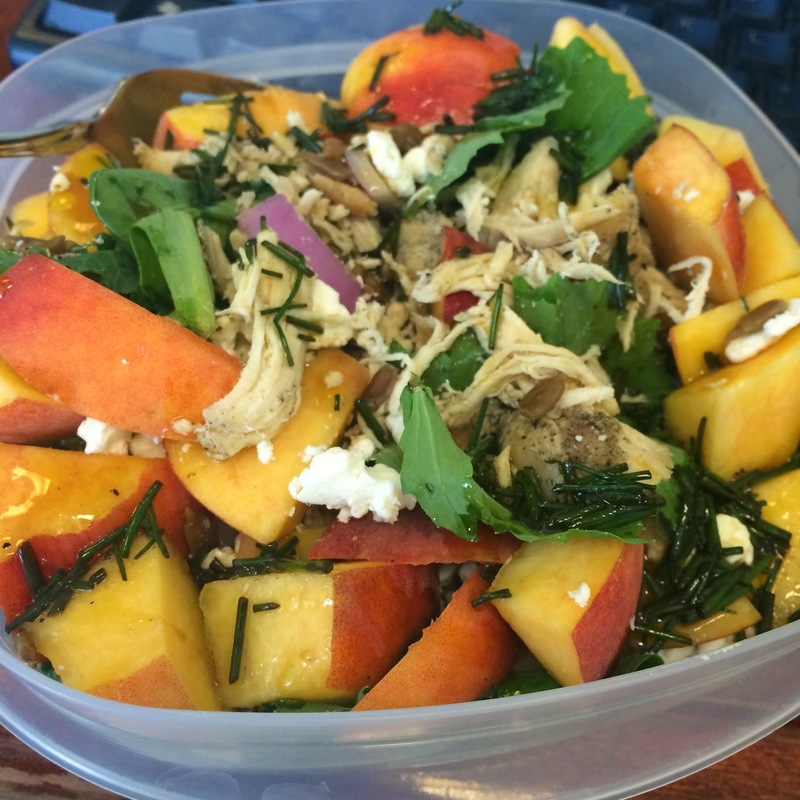 Arrange greens in a bowl and top with diced peaches, sliced onion, chicken, goat cheese, and sunflower seeds. *This recipe will make more dressing than is needed for this amount of salad. Store leftover dressing in an airtight container in the refrigerator. Yum this sounds delicious! Might have to make this for lunches next week! It's a perfect lunch salad!